Kanchanaburi or River Kwai has been one of the most surprising golf destinations this year. 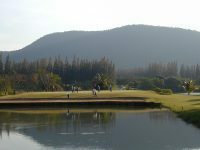 I have personally recommended golf in Kanchanaburi to over 100 golf tourists and they are all amazed at the variety, quality, and superb golf values in the area. This review will cover of some of the better plays in the area. The best golfing in River Kwai is by and far the 27 – hole Nichigo Resort and Country Club championship course, designed by Mitsuaki Kobayashi who has more than 90 golf courses around the world to his credit. Idyllically nestled in between the mountains and the legendary Kwai River, this club is set in a picturesque valley in a peaceful setting. The fairways are of imported Noshiba grass that needs no insecticides to remain healthy all year round. Nichigo’s Clubhouse is an ideal venue for you to admire scenic views of landscaped gardens and a sparkling lake, whilst enjoying international specialties and local dishes. There is an interesting miniature replica of the bridge over the River Kwai. Mission Hills Golf Club is another challenging Jack Nicklaus designed golf course in beautiful natural surroundings. Set on a sloping hill, mature palms line the fairways of this outstanding course that relies on water, sand, trees and, Nicklaus’ specialty, waste bunkers, for its hazards. The course has a choice of five well-spaced tees for you to choose from according to your abilities (or how many beers you consumed the evening before). A number of holes have "alternative fairways", with different routes to the greens. The big timber clad clubhouse is nice to relax in after your round. Evergreen Hills Golf Club is set in a valley between round-topped hills covered with jungle, with fine views over crystal clear lakes. From the standard men’s tees you will find the course, designed by Artanan Yomchinda, not too long but still a fair test of golf. Water comes into play on the 3rd, 4th and 6th holes on the outward nine and on the inward nine at the 15th, 16th and 17th. At the 17th signature hole water encroaches on both sides of the fairway, and you need to play straight if you are not to hear the caddie’s dreaded shout of “tok nam!”. Tomorrow I will finish up my discussion about River Kwai golf by discussing the various accommodation options and reviewing a little bit of area culture and history. In the meantime, if you need to reach me you can contact me at my Thailand golf vacation company.